Is it The One? The new development at the southwest corner of Yonge and Bloor streets will be sold with that catchphrase, and it will in some ways earn that title. The design by global architects Foster and Partners is tall, brawny and complex. The project, which developer Sam Mizrahi and the architects presented to a community meeting Wednesday night, would be the third tall tower to rise at the corner. However, in size and architectural character, it would stand out: The proposal places 72 levels of apartments on top of an eight-level luxury shopping mall, and wraps a grid of structural steel outside of its glass skin. The planned tower would be Canada's tallest, aside from the CN Tower, and perhaps its most expensive. Mizrahi Developments will ask the city for a total height of 318 metres, or more than 1,000 feet, with nearly one-million square feet of retail and residential space; the budget, Mr. Mizrahi said in an interview, will approach $1-billion, excluding the land costs. The proposal is being submitted to the city this week. If approved in its current form, it would be an exceptionally large building – the tallest in Toronto other than the CN Tower. Yet Yonge and Bloor is already emerging as a cluster of tall mixed-use towers, well-placed at the junction of two subway lines. 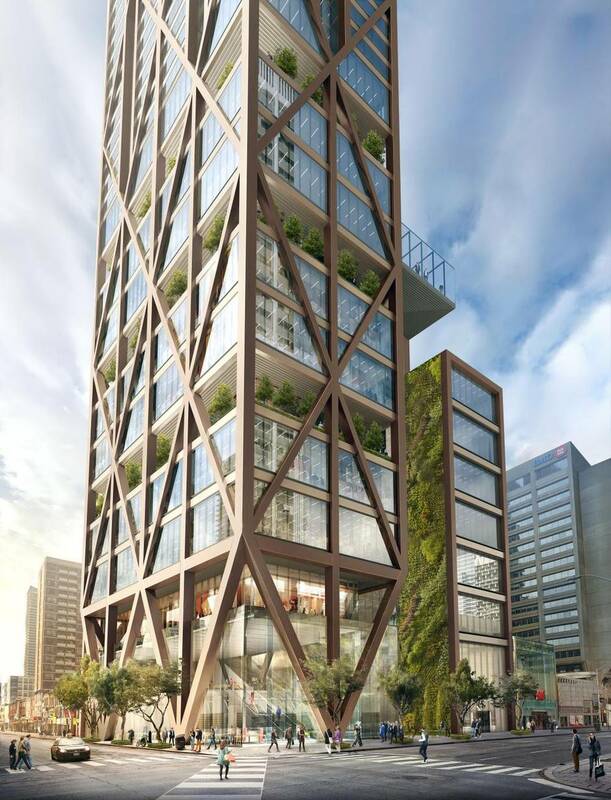 The developer’s argument for height and density will be aided by two nearby precedents: One Bloor East, across the street, is already rising to a height of 257 metres, and the Holt Renfrew redevelopment at 50 Bloor West was recently approved at 230 metres. 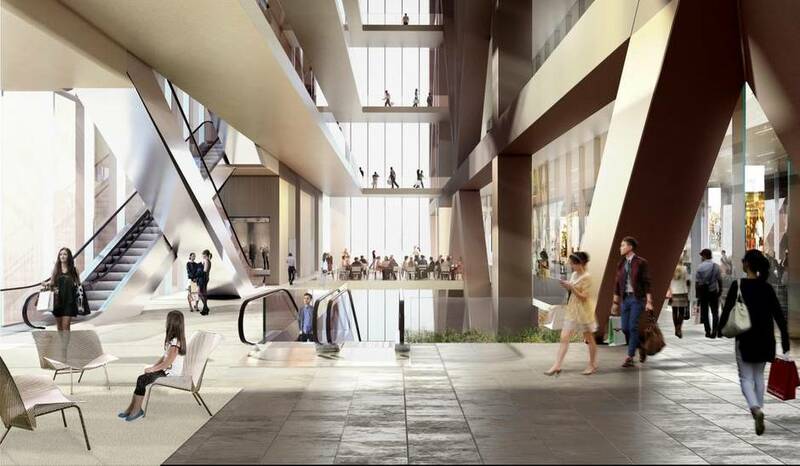 Mr. Mizrahi plans to clear the site, including the former Stollery’s, and proceed immediately with construction – digging more than 30 metres down for 10 underground levels, and leasing out the building’s retail space starting in 2018, even as construction continues on the tower above. The design, by London-based Foster and Partners with the Toronto firm Core Architects, is a three-part composition: At ground level would be retail and restaurant space, reaching up through eight levels and pierced by a public atrium; above that, a box containing the tower’s mechanicals; and on top, a tower, about 9,000 square feet on each floor, of condo apartments. The tower would fill about half of the site, tight to the corner. A smaller eight-level box would form the western half of the retail space. The tower would place its structure on display. From ground to tip, the tower’s bulk would be carried by a steel exoskeleton – perhaps coated with bronze paint – that stands around the facades of the tower, leaving the interiors of each level wide open. 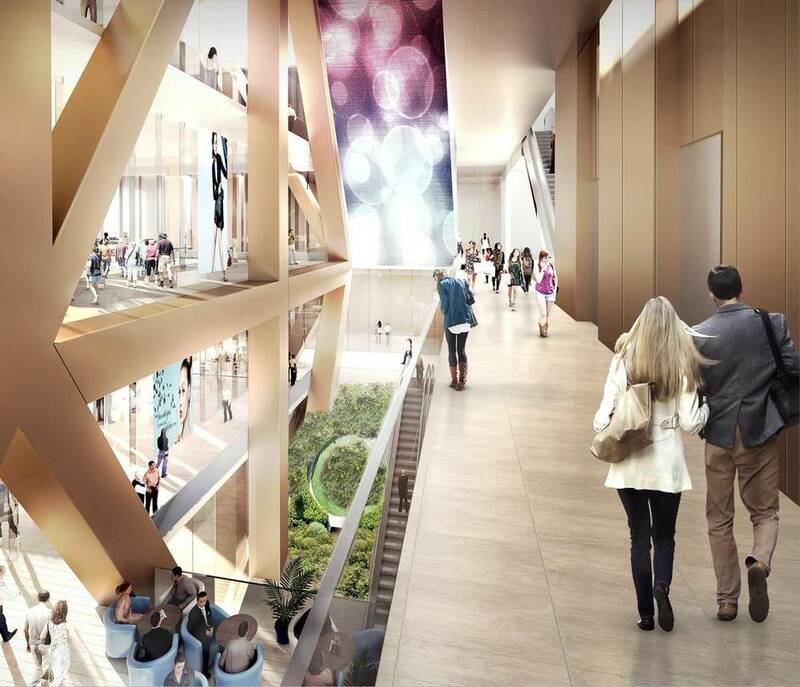 Each facade would include one or two strips of “winter gardens,” semi-enclosed outdoor spaces, instead of balconies. In drawings, this composition makes the tower feel like a piece of infrastructure – giving it a strange kinship with the 1970s behemoths on the northeast and northwest corners of Bloor. Below ground, the building would connect to the PATH system to the north, and also reach diagonally under the intersection of Yonge and Bloor to connect to the subway. In a strong concession to the public realm, sidewalks around the building would be widened substantially, to at least five metres on Yonge and at least eight metres on Bloor. 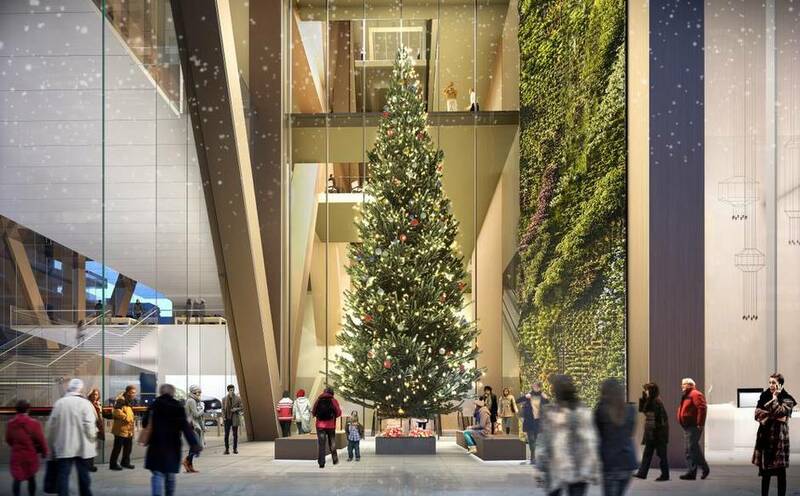 The public lobby, facing Bloor, would be a 40-metres-tall atrium that, Mr. Mizrahi hopes, will evoke the strong urban space of New York’s Rockefeller Center. Mr. Mizrahi has made an ambitious choice of architects. Foster is among the best big architecture firms in the world. Sir Norman Foster co-founded the office in 1967, and by the 1970s, he was recognized as one of the leading architects of his generation. The firm grew to corporate scale – they now employ more than 1,000 people in 14 offices – but continues at a high level of design ambition. The firm’s most prominent current project is designing Apple’s new headquarters in Cupertino, Calif. In Canada, the firm has designed the Leslie L. Dan Pharmacy Building at the University of Toronto; a tower in Vancouver; and The Bow in Calgary, that city’s most prominent high-rise that, like other Foster high-rises, uses an exoskeleton structure. For Mr. Mizrahi, the project will be a radical step up in size and complexity. He worked briefly in real-estate development in the 1980s, he said, but he is best known as the founder of DoveCorp Enterprises, a dry-cleaning and laundry chain. He moved back into real estate in 2008, building custom houses in Forest Hill; then he marketed and is developing and building two condo towers on Davenport Road in Yorkville. Mr. Mizrahi’s company was the general contractor for those buildings, which are nine- and 12-storeys tall. In design terms, Mr. Mizrahi will be stretching even further. The condos he built on Davenport Road are what builders often call “traditional” – in this case, a version of the limestone buildings of Haussmann’s Paris, stretched upward and capped in glass. Their design, by the local firm Page and Steele, is competent at best. Yonge and Bloor’s context is changing rapidly, with One Bloor East and the recently approved 50 Bloor West proposal. The Mizrahi building sits on a smaller piece of land than either of those, and it asks for approximately double the density of either building – but it would also have fewer condo units, 560, than either, and its larger retail area would, the developer argues, be largely served by transit. On the ground, the demolition of the Stollery’s building on the site is well under way and is continuing. Mr. Mizrahi faced harsh criticism when that 80-year-old building began to fall. Though the city granted a demolition permit, Councillor Kristyn Wong-Tam said at the time that she had hoped to have the building reviewed for its heritage value and that Mr. Mizrahi’s demolition crews had proceeded without getting some necessary minor permits. Mr. Mizrahi continues to insist that proper procedures were followed. Sean Teperman of Teperman Wrecking, the demolition contractor on site, said this week that the city has not issued any stop-work order or cited any permit violations on the site.